The Atlanta Region Wall Map utilized by many successful area businesses to organize efficient sales & service territories, routing and delivery for over 15 years! 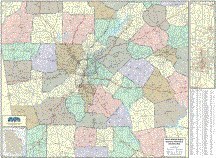 Business Planning & Zip Code Wall Map Metropolitan Atlanta Region covering more than 40 surrounding counties with federal and state highways, major streets, suburbs, cities / towns, outlining 5 digit ZIP codes, Interstate hwy exit numbers, major landmarks, points of interest and attractions. 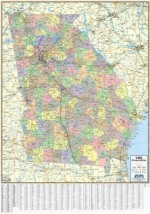 Large Georgia Wall Map for business 54x72"